Lazarini F, Katsimpardi L, Sarah Levivien S, Wagner S, Gressens P, Teissier N, Lledo PM. Congenital cytomegalovirus infection alters olfaction prior to hearing deterioration in mice. J Neurosci. 2018 Dec 5;38(49):10424-10437. Denizet M, Cotter L, Lledo PM, Lazarini F (2017). Sensory deprivation increases phagocytosis of adult-born neurons by activated microglia in the olfactory bulb. Brain Behavior and Immunity 2017 60, 38-43. Cressant A, Dubreuil V, Kong J, Kranz TM, Lazarini F, Launay JM, Callebert J, Sap J, Malaspina D, Granon S, Harroch S. (2017) Loss-of-function of PTPR γ and ζ, observed in sporadic schizophrenia, causes brain region-specific deregulation of monoamine levels and altered behavior in mice. Psychopharmacology (Berl). 2017 Feb;234(4):575-587. Siopi E, Denizet M, Gabellec MM, de Chaumont F, Olivo-Marin JC, Guilloux JP, Lledo PM, Lazarini F. Anxiety- and Depression-Like States Lead to Pronounced Olfactory Deficits and Impaired Adult Neurogenesis in Mice. J Neurosci. 2016 Jan 13;36(2):518-31. Lazarini F, Gabellec MM, Moigneu C, de Chaumont F, Olivo-Marin JC, Lledo PM Adult neurogenesis restores dopaminergic neuronal loss in the olfactory bulb. J Neurosci 2014, 34:14430-42. Lazarini Françoise, Gabellec Marie Madeleine, Torquet Nicolas, Lledo Pierre Marie (2012) Early activation of microglia triggers long-lasting impairment of adult neurogenesis in the olfactory bulb. Journal of Neuroscience, 32 (11) :3652-3664. Lazarini F and Lledo P-M. (2011). 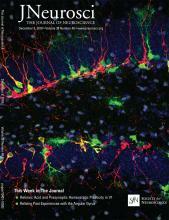 Is adult neurogenesis essential for olfaction? Trends in Neurosciences. vol34 pp20-30. Tepavčević V, Lazarini F, Alfaro-Cervello C, Kerninon C, Yoshikawa K, Garcia-Verdugo JM, Lledo PM, Nait-Oumesmar B, Baron-Van Evercooren A (2011) Inflammation-induced subventricular zone dysfunction leads to olfactory deficits in a targeted mouse model of multiple sclerosis. J Clin Invest. 121:4722-34. Feierstein C, Lazarini F, Wagner S, Gabellec M-M, de Chaumont F, Olivo-Marin JC, Boussin FD, Lledo P-M and Gheusi G. (2010). Disruption of adult neurogenesis in the olfactory bulb affects social interaction but not maternal behavior. Frontiers in Behavioral Neuroscience, 4, Article 176. Lazarini F, Mouthon MA, Gheusi G, de Chaumont F, Olivo-Marin JC, Lamarque S, Abrous DN, Boussin FD, Lledo PM. Cellular and behavioral effects of cranial irradiation of the subventricular zone in adult mice. PLoS One. 2009 Sep 15;4(9):e7017.